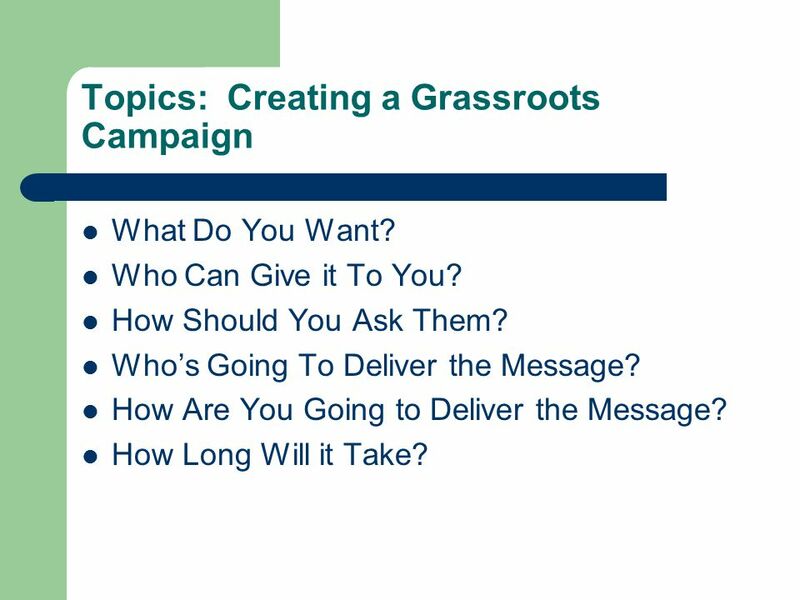 2 Topics: Creating a Grassroots Campaign What Do You Want? Who Can Give it To You? How Should You Ask Them? 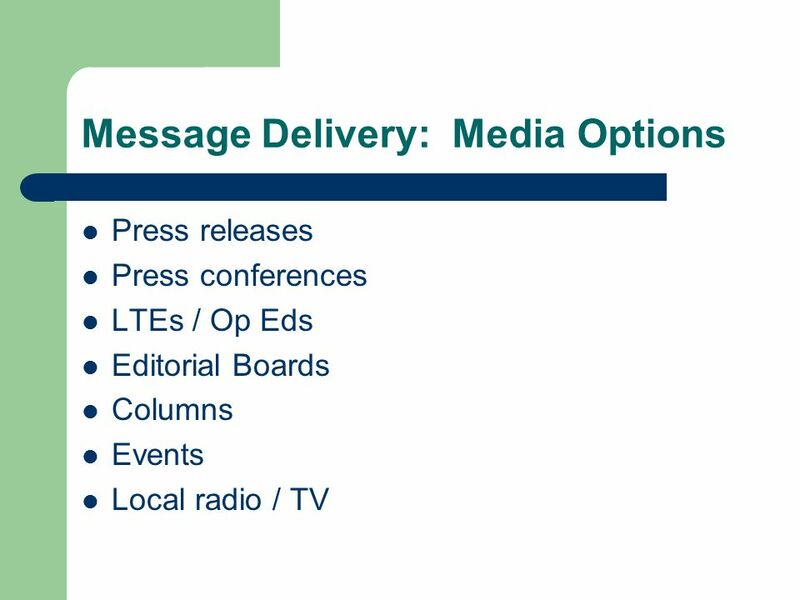 Who’s Going To Deliver the Message? 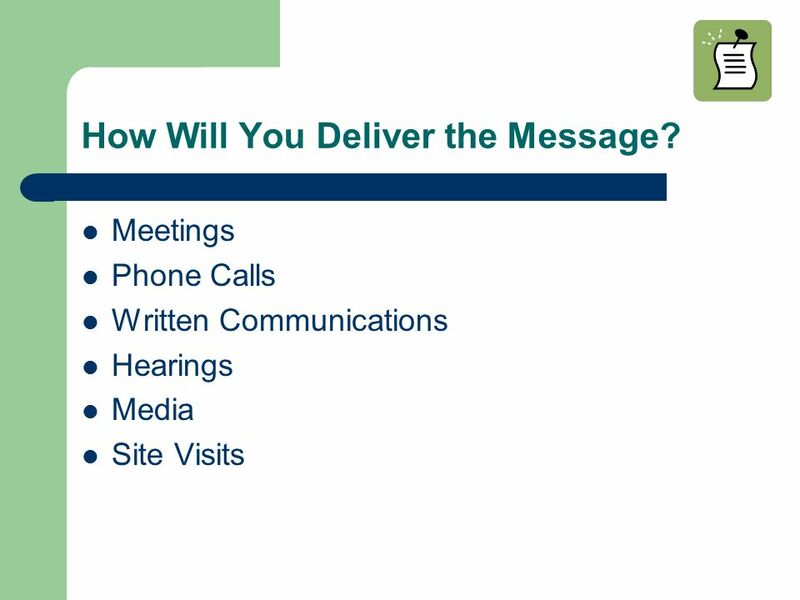 How Are You Going to Deliver the Message? How Long Will it Take? 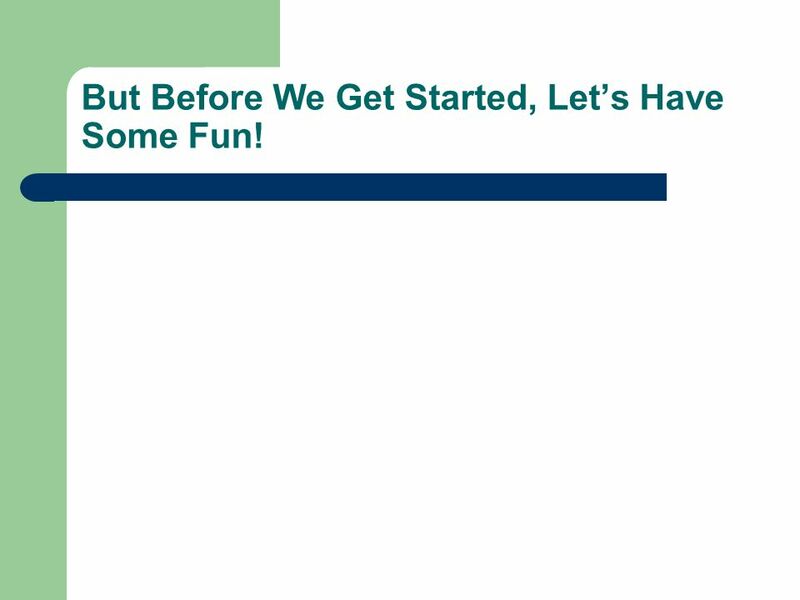 3 But Before We Get Started, Let’s Have Some Fun! 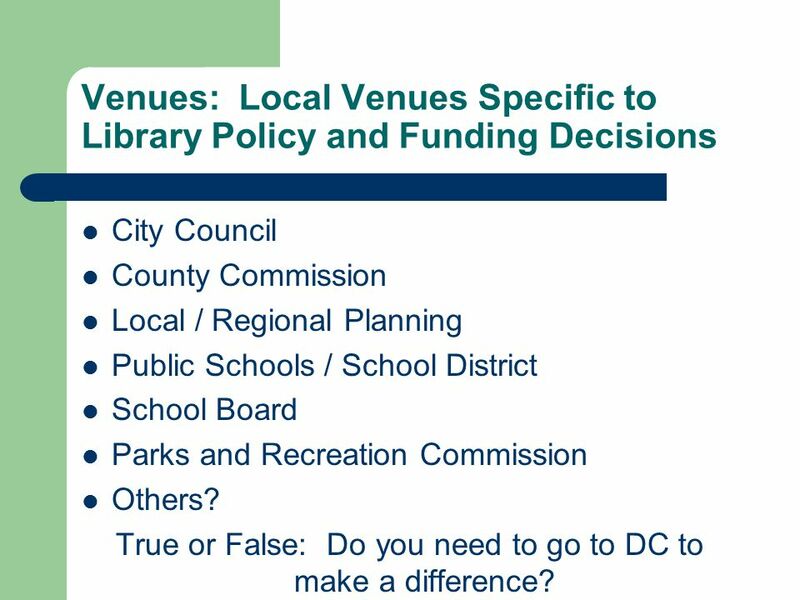 5 Venues: Local Venues Specific to Library Policy and Funding Decisions City Council County Commission Local / Regional Planning Public Schools / School District School Board Parks and Recreation Commission Others? 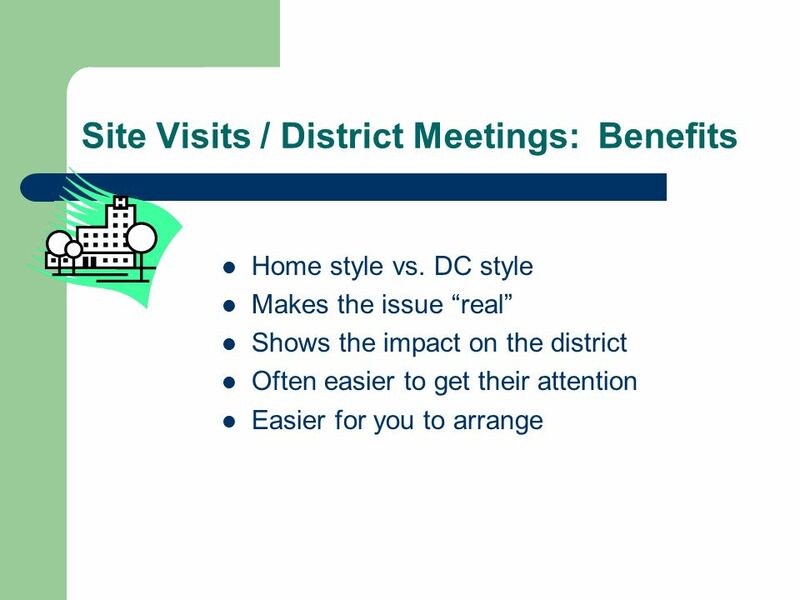 True or False: Do you need to go to DC to make a difference? 6 Where to Start: What do You Want? 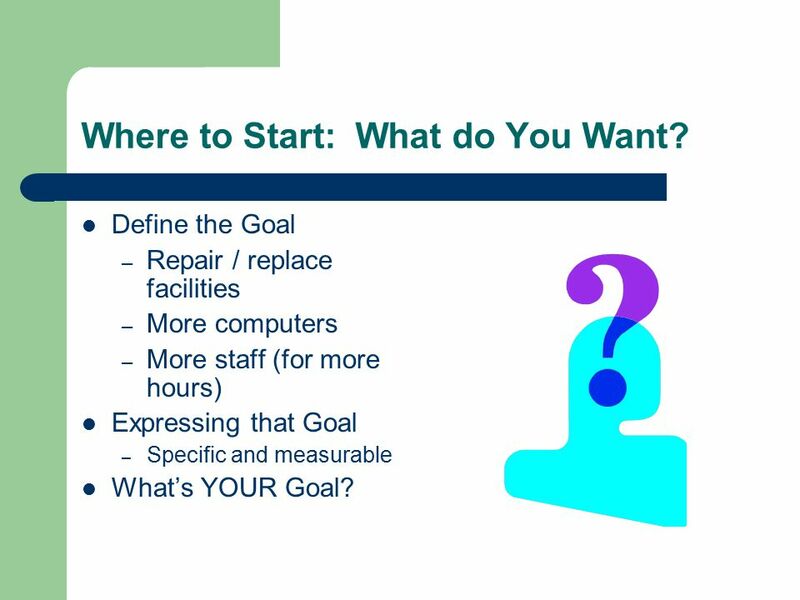 Define the Goal – Repair / replace facilities – More computers – More staff (for more hours) Expressing that Goal – Specific and measurable What’s YOUR Goal? 7 Who Can Give That To You? 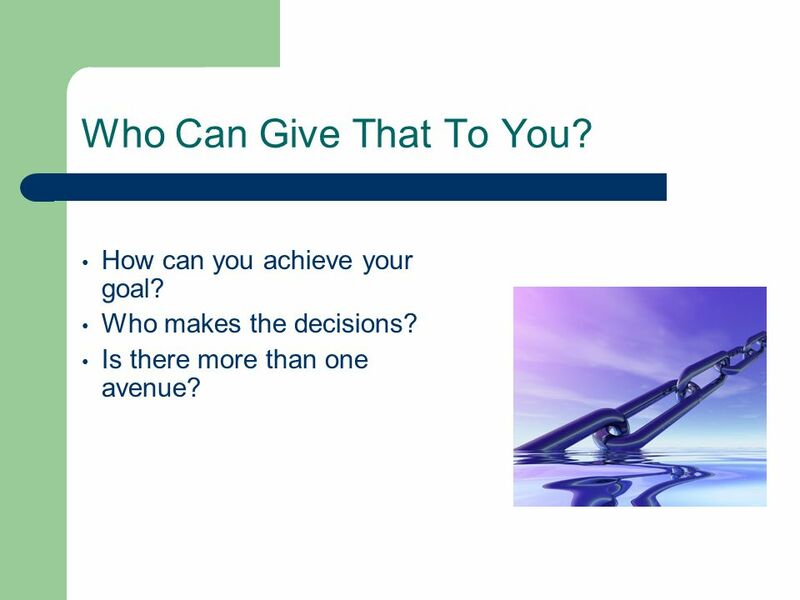 How can you achieve your goal? Who makes the decisions? Is there more than one avenue? 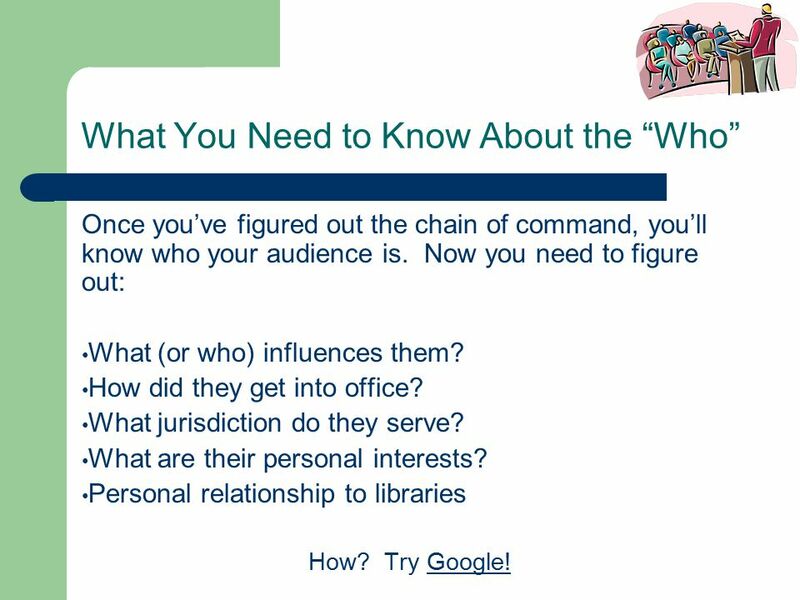 8 What You Need to Know About the “Who” Once you’ve figured out the chain of command, you’ll know who your audience is. Now you need to figure out: What (or who) influences them? How did they get into office? What jurisdiction do they serve? What are their personal interests? Personal relationship to libraries How? Try Google!Google! 9 What Will You Say to Them? 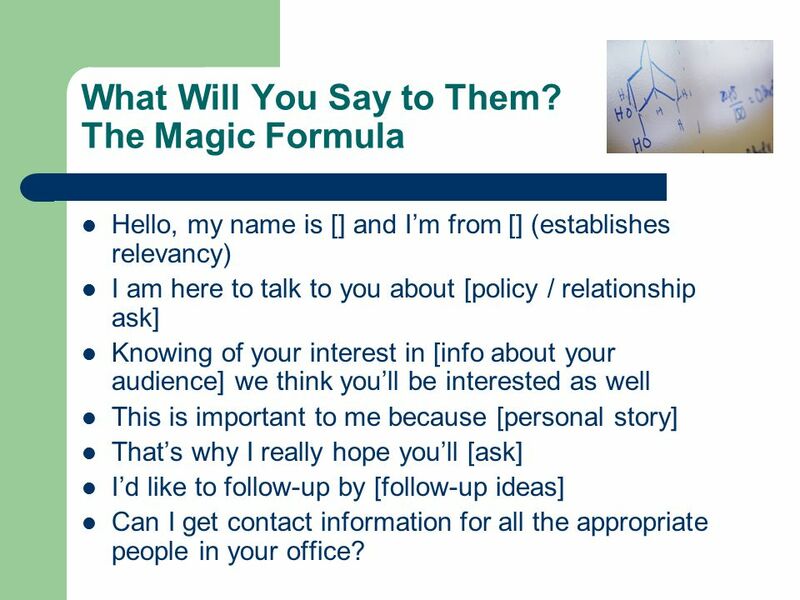 The Magic Formula Hello, my name is  and I’m from  (establishes relevancy) I am here to talk to you about [policy / relationship ask] Knowing of your interest in [info about your audience] we think you’ll be interested as well This is important to me because [personal story] That’s why I really hope you’ll [ask] I’d like to follow-up by [follow-up ideas] Can I get contact information for all the appropriate people in your office? 10 Who Will Ask? 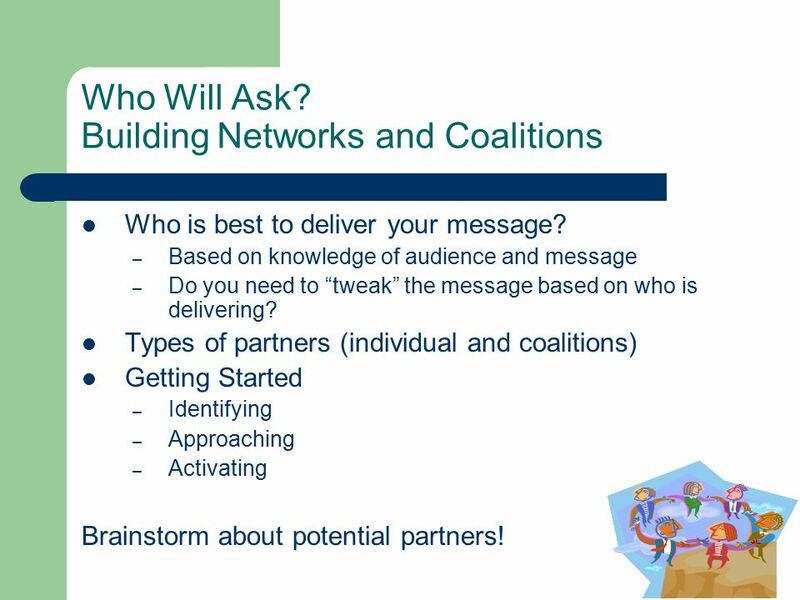 Building Networks and Coalitions Who is best to deliver your message? 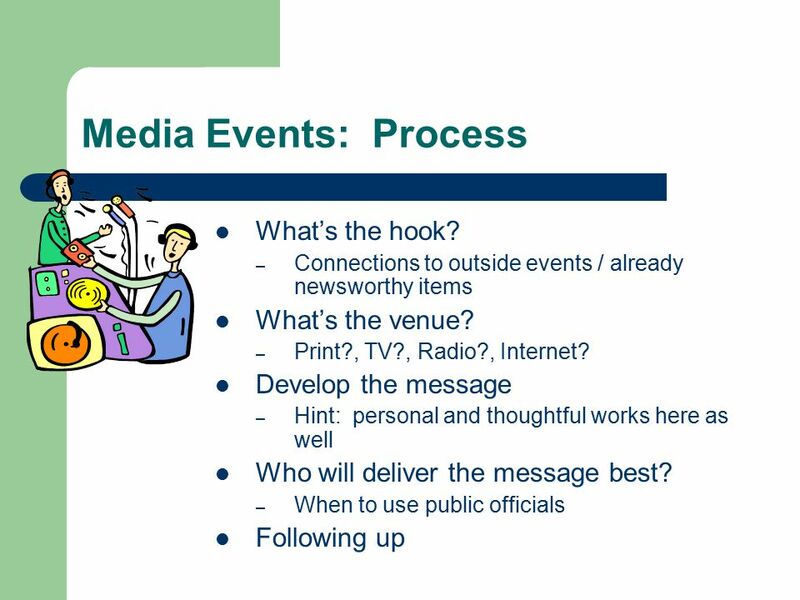 – Based on knowledge of audience and message – Do you need to “tweak” the message based on who is delivering? 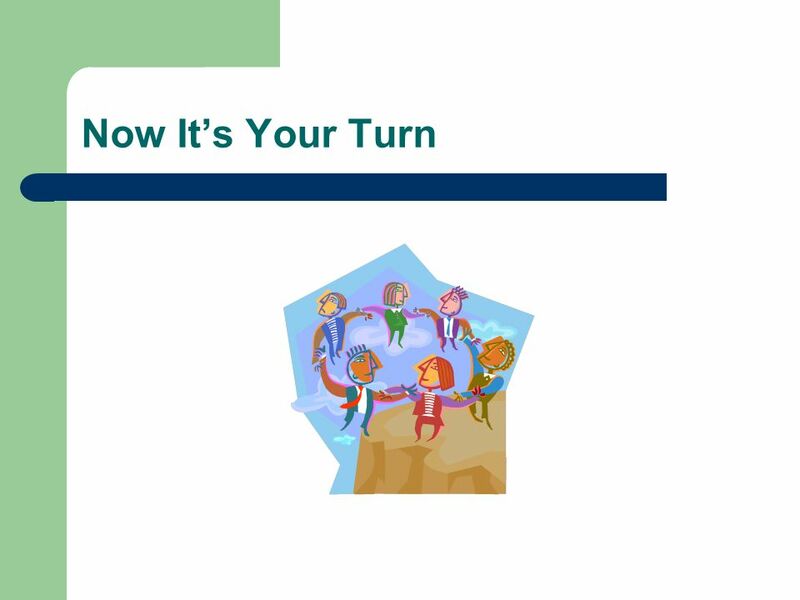 Types of partners (individual and coalitions) Getting Started – Identifying – Approaching – Activating Brainstorm about potential partners! 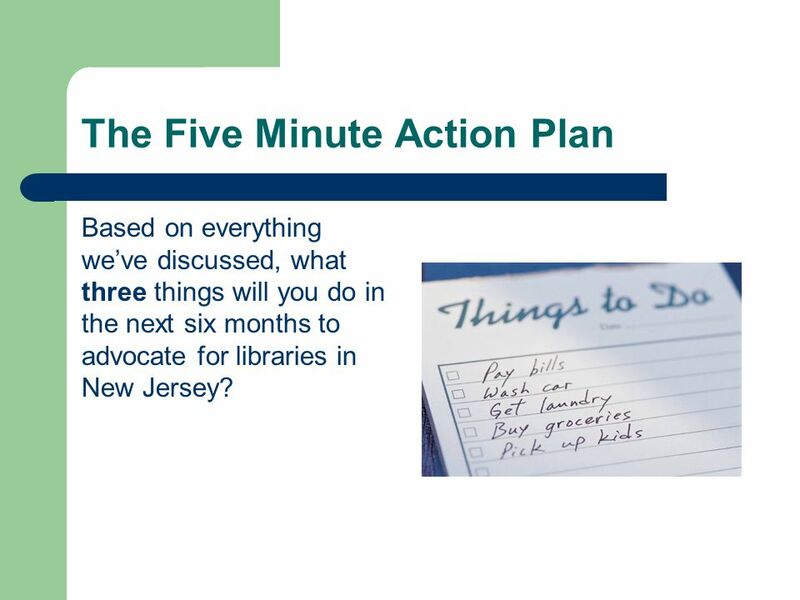 20 The Five Minute Action Plan Based on everything we’ve discussed, what three things will you do in the next six months to advocate for libraries in New Jersey? 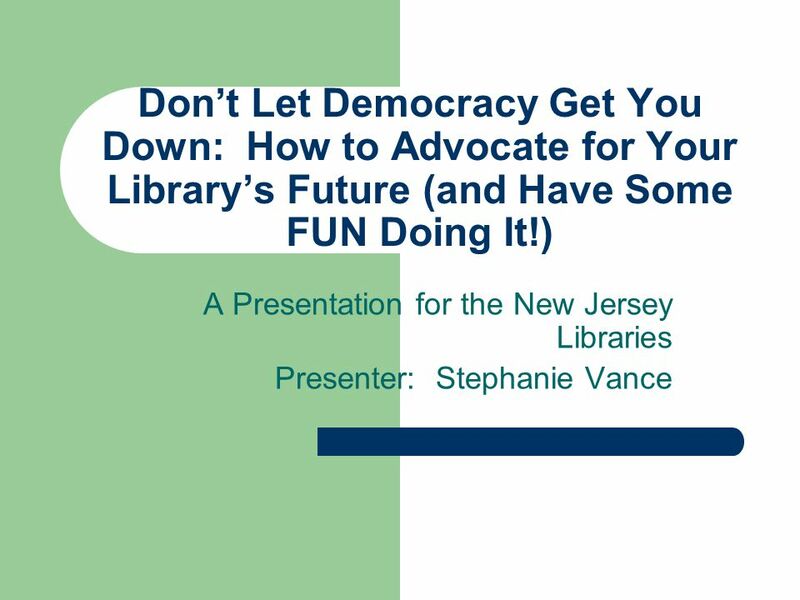 Download ppt "Don’t Let Democracy Get You Down: How to Advocate for Your Library’s Future (and Have Some FUN Doing It!) 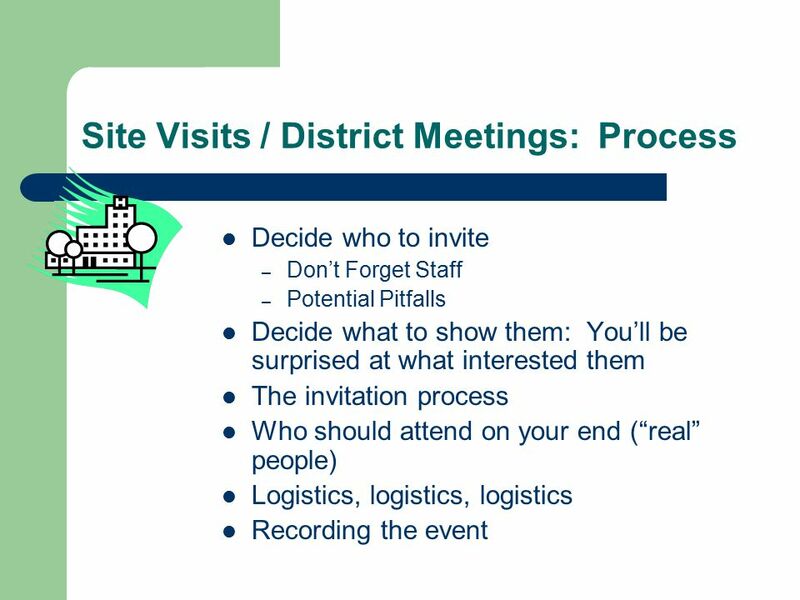 A Presentation for the New Jersey Libraries Presenter:"
Getting Your Point Across to Congress A Presentation for the Dirksen Centers Congress in the Classroom Presenter: Stephanie Vance. 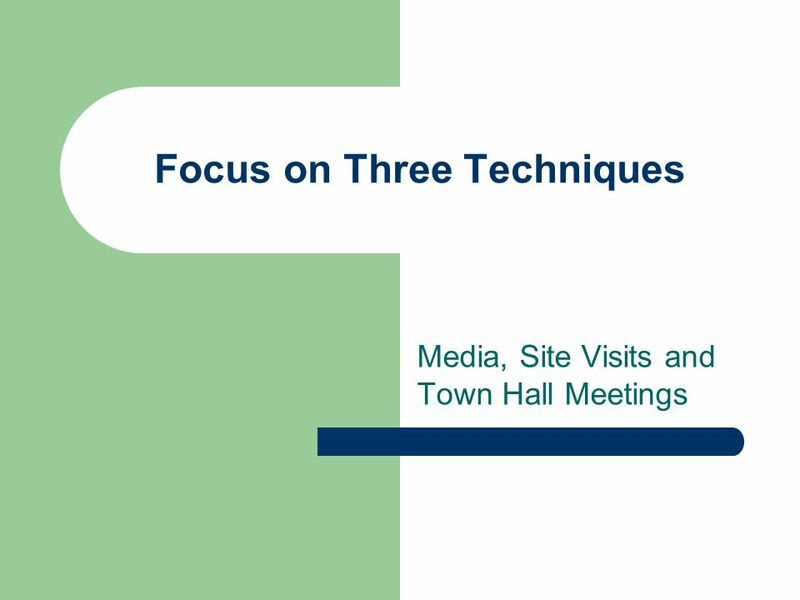 How to Set Up A Faces of Agent Orange Town Hall Meeting. 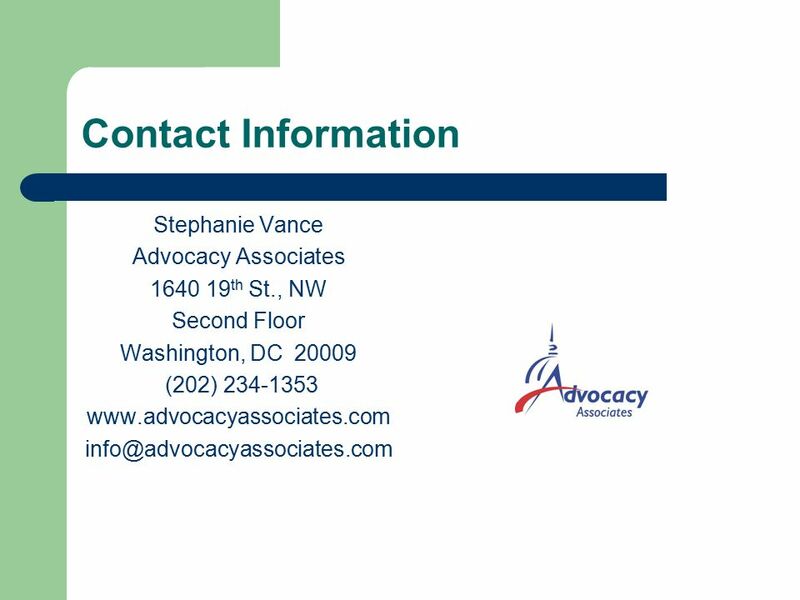 The Role of the State Coordinator & The Importance of Grassroots Advocacy. Policy Training Session Nelda Brown, Policy Director National Service-Learning Partnership. 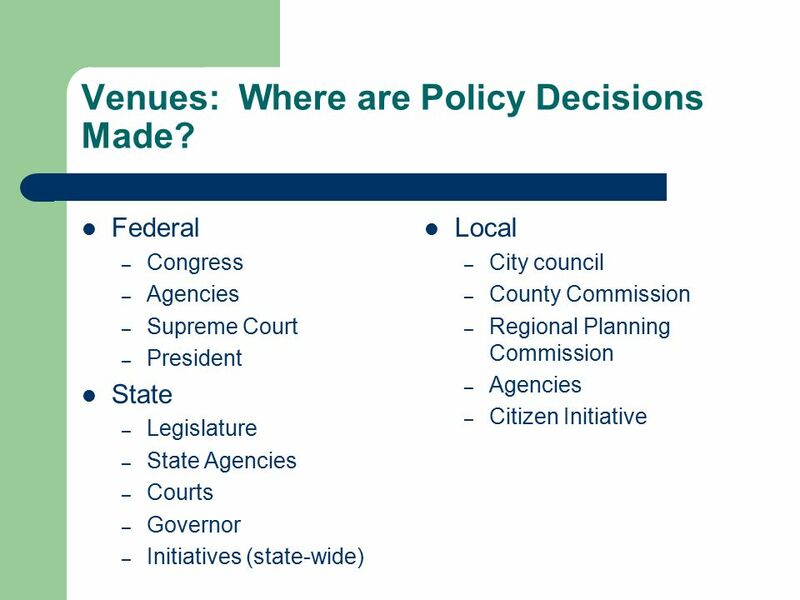 Influencing State Policy: How You Can Make a Difference! Myrna R. Mandlawitz, Esq. LDA Public Policy Director. LSU AgCenter Internal Leadership Local Support Update May 14, 2013. Advocating Excellence for FCCLA February 5, 2014 Rachel VanPelt, National Consultant Team. VFW Legislative and Political Activism NEW COMMITTEE MEMBERS 2013. 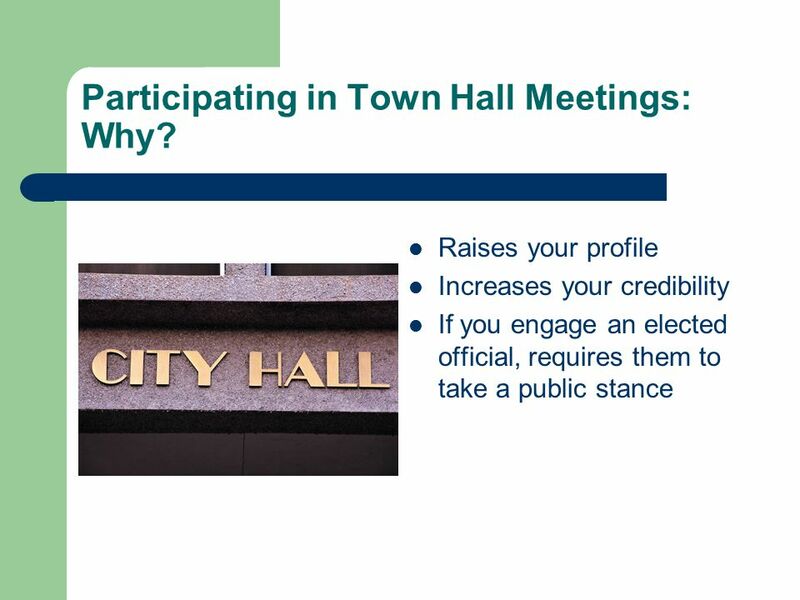 “I Wish Someone Had Told Me…” December 17, 2013 Brad King Co-Director, Indiana Election Division 2014 Election Administrators Conference. 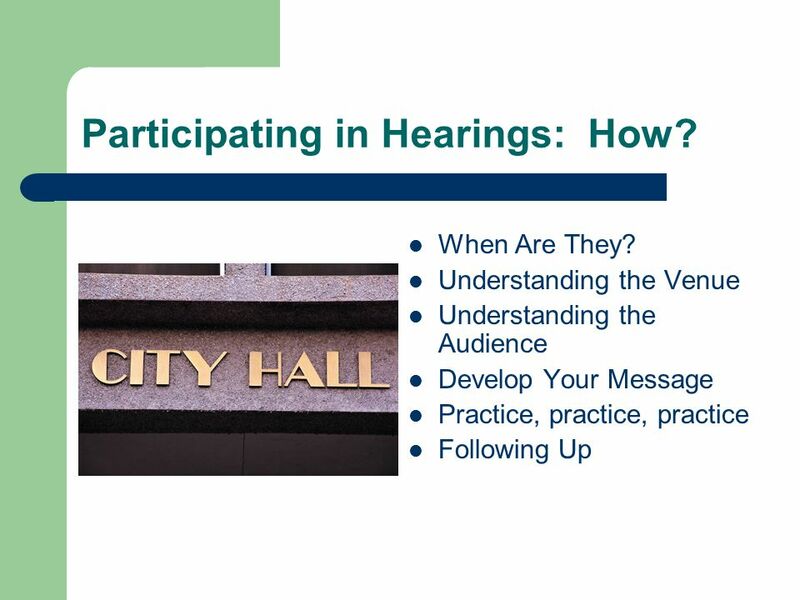 A Voice For Volunteers: The Legislative Process and YOU! © 2012 Ledge Counsel, Inc. Advocacy Strategies for New CAN Coordinators How to Grow A Successful Grassroots Network CEC National Legislative Conference June 7, 2014. MARKETING AFTERSCHOOL HOW TO MAKE A CASE AND BUILD SUPPORT FOR YOUR PROGRAM.